Neil Hannon, the mastermind behind baroque popsters Divine Comedy (if anyone has cornered the market on ork-pop, it is surely Hannon), actually began this adventure writing jangly REM-type songs. Oh, what a few years will do. Hannon gave up the rock ghost years ago (and even the band ghost: Hannon serves as Divine Comedy’s sole member), had a daughter (who makes her debut here), and on the band’s new album, Victory for the Comic Muse, “let it all hang out.” Or, at least as someone as detail oriented as Hannon can allow. Bullz-Eye: I was worried that the new album wasn’t going to come out in the States at first. Neil Hannon: Yeah, sorry about that. I don’t quite know what was going on. I don’t really have my finger on the pulse of the business affairs (chuckles). So I can’t really illuminate you on why that happened. But hey, better late than never. BE: Absolutely. 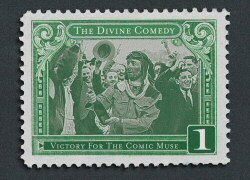 This is kind of an obvious question, but when you were first making Fanfare for the Comic Muse, did you ever envision making an album like Victory for the Comic Muse all these years later? NH: Um, I don’t know what album it would be, but I knew I’d be making albums 15 years later. I just felt that I’d also be playing Wembley Stadium than the pub. But you know, you get older and your ambitions and things change, so I’m very happy just to be here at all, really. BE: So what’s new in your life since the release of Absent Friends? NH: Um, thankfully not much. I had a year – well, less than that – of writing with and for other people on various projects. It was while I was doing all that that I accidentally wrote lots and lots of songs, and one day I discovered that I really ought to make an album, though I really wasn’t intending to. I kind of liked that, and I wanted to keep the spontaneity going through the process, so I couldn’t overcomplicate things, as I usually do. BE: I saw that you contributed a couple songs to the new “Doctor Who” series. BE: How did that come about? NH: It’s funny how nobody from Britain has actually questioned me upon this, and then suddenly two interviews in a row from America do! (Laughs) Very strange. Literally, I was asked to add my vocal by the composer of the songs, who writes for the show. And I didn’t feel that I could say no, simply because I spent my childhood watching this program. It would be just plain wrong to not do it. "I knew I'd be making albums 15 years later. I just felt that I'd also be playing Wembley Stadium than the pub." BE: I just read today, to my great delight, that you contributed a vocal to Air’s upcoming album. NH: Yeah, that came out of the Charlotte Gainsbourg record that I wrote some lyrics for last year. (Air bandmates) JB (Dunkel) and Nicko (NicolasGodin) were doing the music for that whole project. We got on very well, and one of the songs that I wrote lyrics for didn’t get used on her album. So they decided to have me sing it on their album! It’s pretty much two birds, one stone (chuckles). BE: Well, let’s get back to your record. There’s always been a dry sense of humor about your music, but with “To Die a Virgin,” you’ve gotten downright playful. NH: (Laughs) Down and dirty! That’s probably the most vulgar I ever get. It’s more of a end-of-the-pier, seaside humor, you know? BE: Well, it’s also looser than anything you’ve done lately. The thing that stands out to me the most is not even the lyrical content, so much as how bouncy the song is. NH: Yeah, that’s true. On Absent Friends, it did get kind of acutely self-aware (laughs). And that makes for a good, intense listen. But on this album, I was just feeling a bit perkier, really. A bit more chipper, generally. And I felt more able to just let it all hang out, and not be so completely obsessed with the style of things. BE: Is the rest of the dialogue from “The Camomile Lawn” as funny as the snippets you put in the intro to “To Die a Virgin”? NH: Absolutely not! (Laughs) And it’s nothing to do with the sexual content. It’s the mention of war. BE: I’m really sorry to hear that. NH: Well, so am I, but I live in Dublin now, so I don’t care. BE: Is it true that most of the album was recorded in two weeks? NH: Yeah! Everything apart from the vocals, we did more or less live at Air (Studios) – not Air, what am I talking about, RAK – in North London. Lots of my friends and musicians from London, we all sort of put notes in front of them, and off we went. Put lots of mics in there, it was great. BE: I was wondering how you got so much on tape so quickly. NH: She’s absolutely great, but she should be in bed. BE: Are you familiar with Rufus Wainwright’s material? NH: Yes, very much so. I absolutely adore his stuff. Brilliant. BE: Have you heard his song “Go or Go Ahead”? NH: Which album is that on? NH: Oh, damn. That’s the one I don’t have! (Laughs) I have all the others. Oh, right, must pick that up. NH: (Laughs) Oh, golly, I hope not too like my song! BE: Your big string crescendo? He pretty much nicked it. BE: Well, you were the first one that I heard do it. Cornerstone Rep: Hey, David, we have time for one more question. BE: That’s okay, I only have one more, anyway. (This was a bold-faced lie, of course, but I wasn’t about to push it.) I’m going to take you back a couple albums. You’re in Chicago, playing a gig at Schuba’s in support of Regeneration. You’re playing a ballad, and there’s a guy that’s just blabbing to the point where the rest of the audience is shushing him, and you’re trying your hardest not to laugh out loud. Does this ring a bell? NH: Um, it does ring a bell. I can’t visualize it, but I know it could have happened quite easily (chuckles). BE: The guy was trying to talk to me. NH: Ha ha! And were you trying to tell him to shut up? BE: I was trying to. I didn’t know the guy, and for the life of me he would not be quiet. So I would like to apologize for that. BE: I’ll let you get back to Willow, but thank you for taking the time to talk with us, I really appreciate it. NH: It was a pleasure. Thanks very much, David.